Pokemon Go has led players to unexplored places in the quest to find and catch the cute, little virtual critters. A pair of Toledo, Ohio players allegedly took their quest a little too far, though, and found themselves in jail after hopping a fence in the Toledo Zoo, according to the Toledo Blade . Robin Bartholomy, 25, and Adrian Crawford, 26, jumped the fence at around 2:30 a.m. July 14, according to affidavits filed with the Lucas County Court. The pair was found near the tiger exhibit and arrested on criminal trespassing charges. 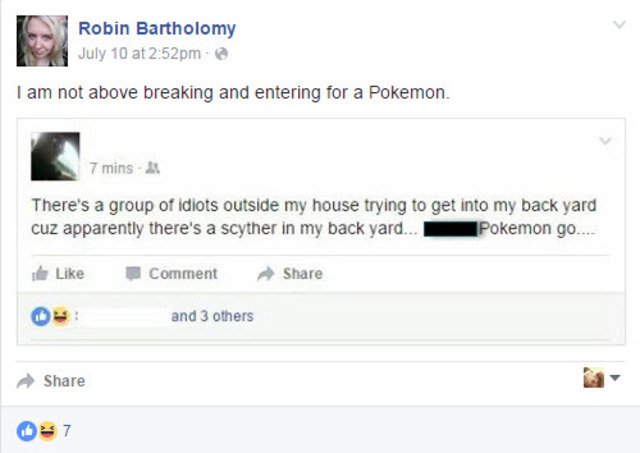 A screenshot showing a July 10 post on what appears to be Bartholomy's Facebook page showed her fascination with the game. The Facebook account is no longer listed in the social media platform's public search. The pair were detected by a security camera, according to Toledo Zoo communications director Shayla Bell Moriarty, who said no animals were at risk and no behind-the-scenes area were accessed. Moriarty told the Toledo Blade the zoo welcomes Pokemon Go players — at the appropriate time. Bartholomy and Crawford are scheduled for an arraignment later on Friday.